Well, today is my FIRST day of summer. WHOO! It started with some Battlestar Gallactica and kitty snuggles. Then I decided to start this summer blog series. I wanted to do a series of quick, short-and-sweet mini-PDs to help teachers as they plan for next year! 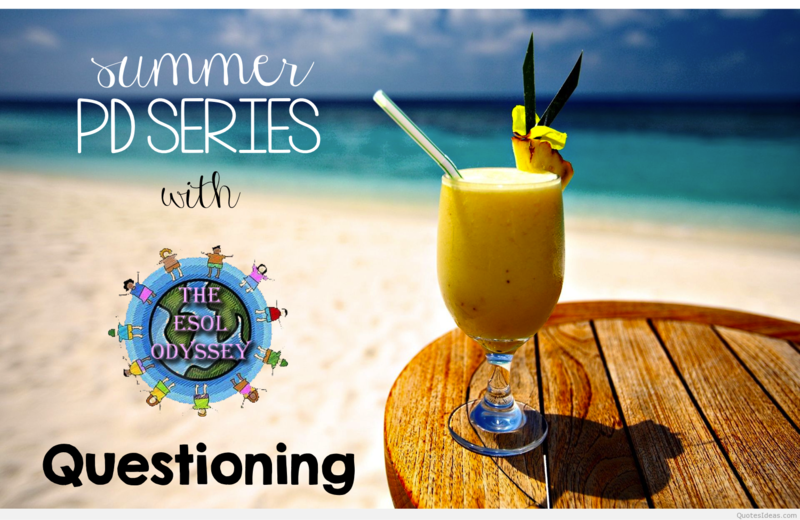 I'll be covering a variety of topics, starting this week with questioning techniques! Many times when I visit mainstream classrooms, I see a lack of questions directed to ELLs- even further, those that are directed towards ELLs are often not high-quality questions. There seems to be a pervading belief that ELLs are not capable of reasoning and responding to higher-order questions. As a result, the questions that are directed at ELLs are often lower on Bloom's Taxonomy. Here's the big secret: ELLs are absolutely capable of higher-order thinking and responding to higher-order questions! We just need to scaffold the language for them so that they are able to demonstrate their understanding. Here is an example: I visited a classroom a few weeks ago that had just gotten a brand-new student. I was observing a lesson on the American Revolution. The ESOL teacher posed a higher order question, and students wrote their responses. Sentence starters were provided for the intermediate students, and the new student was able to write in Spanish to answer the question. Her answer was absolutely correct, then the teacher and her native language buddy helped her write it in English. This shows that even if our ELLs don't have the language to express their knowledge and understanding of what they're learning yet, they are absolutely capable of understanding and responding to higher order questions. We need to scaffold the language to help them! Questioning can be as simple as asking a question and having students respond thumbs up/thumbs down, or as elaborate as using a tool like Socrative, Plickers or Kahoot. It's a great strategy for helping students monitor comprehension during reading, too. Questioning also involves having students construct their own questions! In the slideshow below is a little more information, along with a few low-tech options for teaching ELLs to formulate, differentiate, and respond to questions! I'm glad you are doing this series. I am rereading Making Content Comprehensible for English Learners. It's all about having high academic standards for students learning English. I will be sure to check back. SIOP is excellent, Mary! Thanks for stopping by. I'll be doing this series weekly throughout the summer!